This is another one of those “I impulsively buy things at the grocery store and then have to find uses for them” weeks. This week’s ingredient: blue cheese. Originally I was going to stick it in a crepe with some sort of green vegetable, because everything tastes good in a crepe (incidentally, the first time I liked blue cheese was eating it in a crepe in France). However, its been a difficult weekend, so I switched to one of my ultimate comfort foods: mac and cheese. Cook the macaroni before you start on the sauce. 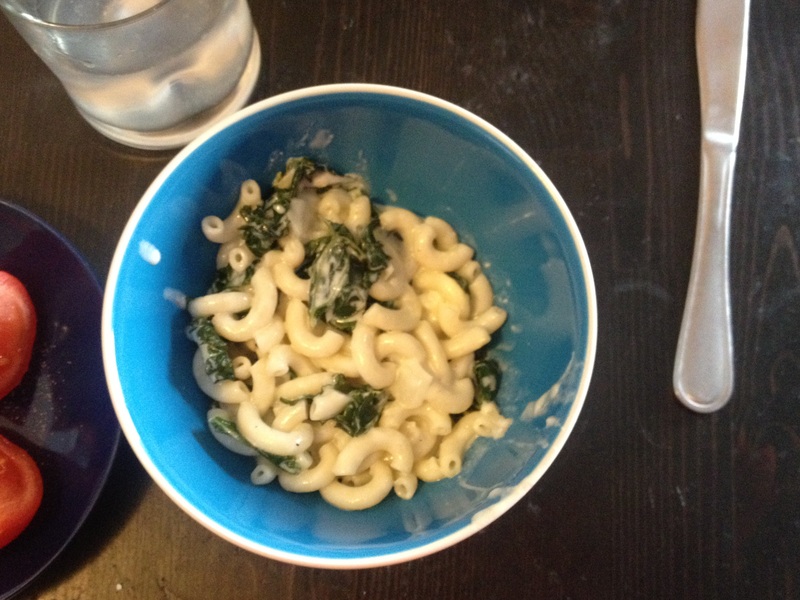 Make however much you like, but I’ve found that 3/4 cup dry macaroni is perfect for 2 servings. I adapted the sauce from this recipe. Melt the butter in a large frying pan, and saute the veggies in there. Once the kale is cooked, add the blue cheese, milk, a little black pepper, and flour. Turn the heat up so that the milk begins to simmer, and stir frequently until the sauce has thickened. The sauce won’t become particularly thick, but it will be thicker than milk. Once the sauce is done, toss with the macaroni until all the pasta is thoroughly coated, and serve. If you want, you can also add parmesan cheese on top of the dish when you serve it.